Elmwood stands strong because of its rich history. In the early 1900s, Harry Gammeter, a utopian, believing that the whole world would be transformed into a paradise if people strongly believed in love, beauty, and respect of one's neighbor, founded the Elmwood Hotel and Resort, then known as Elmwood . 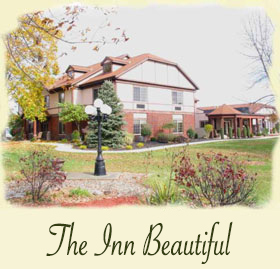 . ."The Inn Beautiful" in Green Springs, Ohio. In 1972, Ron and Judy Robinett (Blaha) purchased Elmwood Nursing Home in Green Springs because of its beauty and history of public service. In 1984, their daughter, Kathy Hunt, became the CEO of Elmwood and has led Elmwood through many years of expansion and development in Seneca and Sandusky counties. For a complete description of our facilities click here. "The mission of Elmwood is a tradition of excellence like none other: Providing extraordinary personal care and service to senior and disabled adults in northwest Ohio." Our philosophy of care provides the understanding that each new resident brings to us their own unique strengths and capabilities. Meeting the physical, medical, social, emotional, and spiritual needs of our residents, Elmwood provides treatment, care, and services for the whole person. Elmwood stands strong not only because of its rich history, and deep sense of philosophy and mission, but also because of its Commitment to Excellence. Simply put, each and every one of our team members is responsible for assisting our residents in having all of their wants and needs met and we value each team member's contribution. Whether a person resides in our assisted living facilities, our skilled nursing facility, or our group homes for MR/DD adults, our Commitment to Excellence is our primary focus. This Commitment to Excellence is evident in each and every one of our communities.